Social media has evolved into a tool for creating and promoting the "self," creating a tension between encouraging individual expression and overemphasizing the self in a collaborative setting. Social media has been around long enough that we have gone through a huge learning curve regarding its functionality and potential — and now we are experiencing the results of its uses in various social, professional and educational contexts. 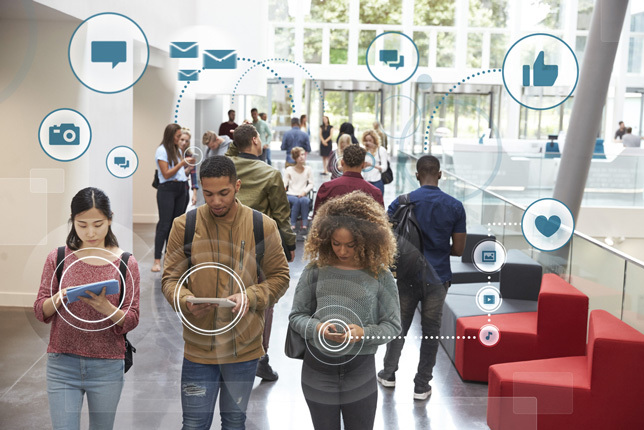 For some years, educators have swayed between excluding and including social media in learning environments and classrooms, searching for a balance between its immediate "connecting" impact and the applied uses in collaborative exchanges in learning. It seems the dominant use of social media has been as a tool for personal exchange, focusing on an individual's authenticity of voice and production; users enjoy the overall control of what is said, displayed, communicated, imaged about "self." Yet, the obsessive focus on self has had repercussions. While social media technology is accessible and user-friendly, as well as highly intuitive overall, the implications for the positioning of "self" in digital social exchanges were, in my opinion, unanticipated. Certainly, the impact on educational exchanges in classrooms or online has been intense. Educators, teaching students of various ages, agree that the positioning of "self" has evolved, impacting many organized group activity exchanges or project exchanges. Being "self-mediated" and "self-published" means that in any dynamic exchange, individuals increasingly require control over how and when the "self" is involved and produced. Of course, we are now familiar with the concept of "selfies" — and we have learned, over these years of the emergence of this phenomenon, that having someone else take your picture is considered less authentic than taking one's own picture or "selfie." In fact, a selfie is now regarded as much more than a picture, and the terms are becoming decreasingly synonymous. The connection between self-capture/self-promotion and personal control/choice is regarded as authentic, and supersedes a posed or "fake" capture by someone else. Therefore, the idea that a selfie is who I really am means that it is a personal creation, and one that is powerful and cannot be challenged. Social media platforms, in general, are predominantly about their users interacting with and producing "self" through fully customizable environments, rich with digital pictures and posts, icons, GIFs, memes and emojis — all being used to carefully craft whatever or whoever the individual deems important for others to see/hear/engage with at any given moment. In an article for the Huffington Post, Zac Thompson stated, "It's no secret that social media has made us more comfortable with the idea of self-absorption." This is incredibly empowering, in some regard, for the individual — and increases the expectation in various environments of individual choice and the control of self to engage or disengage according to the individual desire or interest. In this reality, authentic choice is vital and, indeed, more important than any generic or prescribed engagement. Increasingly, however, psychologists are discussing the "downside" of this obsession with self, as it can also be destructive. For example, if what I have carefully mediated and produced is either disregarded or disagreed with, then that is a personal attack or rejection. This ultimately can lead to individuals becoming less rather than more confident and, ultimately, choosing to disengage rather than engage further. As Katharine Hopson, writing in an article for NPR's Health News, stated, referencing a research study from the University of Pittsburgh: "It turns out that the people who reported spending the most time on social media — more than two hours a day — had twice the odds of perceived social isolation than those who said they spent a half hour per day or less on those sites. And people who visited social media platforms most frequently, 58 visits per week or more, had more than three times the odds of perceived social isolation than those who visited fewer than nine times per week. The study appeared Monday in the American Journal of Preventive Medicine." It would seem that the technologies focused on increasing social interaction actually increase social isolation with excessive use. Back in 2013, I, among others, was writing about the importance of re-educating ourselves as educators on the best uses and applications for social media in learning: "Similar to how we have taught the differences between academic and colloquial or creative language uses, we now must teach the appropriate and effective uses of digital communication and learning-based networking language and tools." We instinctively knew, as educators, that social media technologies would greatly impact our students and our own lives. We also instinctively knew that we would have to think through how and when the technologies would benefit learning the most. We were struggling to find the balance between using the technologies and applying the technologies to improve learning. My sense is that we did not realize that the actual processes of learning through interaction and engagement were changing, along with our students' perception of their role in the process. So, we thought we just needed to confront the interruptive time spent using the technology or the scattered focus of students engaging in social media. We thought that the increase in social engagement would provide support in helping students engage with each other and raise the interest in a higher level of interaction. Instead, we are faced with the intrusion of social media in learning itself. That is, the age-old challenge of helping students engage in their own learning process is still with us even with social media. The learning goal is not student involvement alone but student engagement with learning, which is different. As Donna Freitas wrote in an article in the Chronicle of Higher Education: "In our classrooms, we urge our students to express a range of opinions, to disagree, to become critical thinkers. Online is a different matter. On their Facebook and Instagram feeds, they are learning to conform and be uniformly agreeable, because opinion and difference can come with a high price. Vulnerability, sadness, failure, and nonconformity are not to be owned publicly, lest they reflect negatively on their brands." The objective process of working ideas in the public space and the application of new knowledge in specific contexts of academic or professional use require less of an obsession with "self" and more of an enquiry of thought through a community of learners. The pressure for social media users to self-promote within expected and recognized contexts is antithetical to being free to risk being viewed as "weird" or obscure during an open and vulnerable process of academic enquiry. The reality of high social media users is actually more isolated, albeit self-promoted or produced. Recently, I wrote in an article regarding the current challenges for online educators, "Our challenge is to become more flexible and value and reward innovation, design and application. Additionally, we must maximize critical thinking and problem-solving as the essential skills they are for all jobs now and in the future." Certainly, newer technologies have provided amazing tools and opportunities to increase access and application of learning. Specifically, however, it seems that the overall uses of technology, socially, are intruding into processes and systems of communication and interaction to the level of presenting completely new realities in terms of student perception and involvement. Increasingly, students perceive their own choices and identifications of "self" to be paramount and non-negotiable. Helping students understand that in active learning, engagement with others and various information in an open and cooperative and constructive learning environment is foundational to useful learning and the development of new knowledge. I cannot already know what I need to learn in a process of collaboration with others; such collaboration requires open and unpredictable social and academic interaction. Students accustomed to isolated and self-absorbed environments of their own production are increasingly less likely to desire or understand the level of interaction and open, high-risk dialogue and critical thinking necessary to truly learn and gain new knowledge. Teachers must understand the challenge of this reality and continue to support students to fully engage in the learning process and risk extending themselves into true contexts of critical thought rather than retreat into isolation. This may include planning instruction around "passive" and "active" in a more obvious manner and increasing projects and "talk time" with others rather than individual work. The changing realities that self-promotion is creating in the business world, in professional networking and job seeking, and in other aspects of society are just as affected and evolving. In our discussion here regarding education, the implications for the future are challenging. As educators, we must keep the discussion open and develop strategies and methods to involve and engage while maximizing the skills also being developed through the uses of new technology — and particularly the increased uses of social media. The positive benefits to learning of increased accessibility, mobility and continuous and global connectivity, which have been and continue to be explored and discussed, should not be minimized. However, the emerging challenges of developing skilled but fully engaged learners remains with us. We must continue to explore and reinvent learning spaces to support and develop new generations of learners who are capable of acquiring and applying new knowledge. Freitas, Donna (2017). Instagrim: Why Social Media Makes Students Miserable. The Chronicle of Higher Education. Hobson, K. (2017). Feeling Lonely? Too Much Time On Social Media May Be Why. Health News from NPR. Reynard, Ruth (2013). Controlling Social Media: Current Policy Trends in K-12 Education. Campus Technology. Thompson, Zac (2016). Social Media Is Making Us All Awful and Self Absorbed. Huffington Post. Reynard, Ruth (2017). Technology and the Future of Online Learning. Campus Technology. My thanks also to Bethany Reynard, MAT, elementary school teacher (grades 4 and 5), OH, for her input and discussion on the topic.